MONSEY,N.Y. 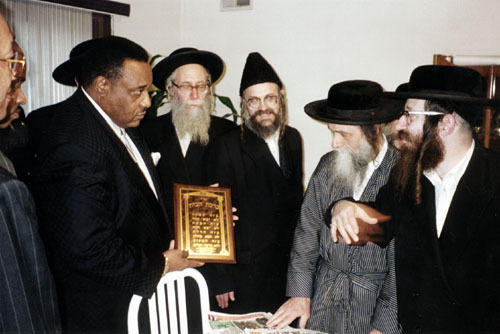 - Nation of Islam Chief of Staff Leonard F. Muhammad led a delegation of Nation of Islam officials to the upstate New York home of Rabbi Yecheskel Gold December 28, 1999 in a continuation of Muslim-Jewish dialogue begun six months earlier. Last June a delegation of rabbis from the orthodox Neturei Karta International community requested a meeting with Nation officials to discuss the arrest at that time of Jewish rabbis in Iran allegedly for spying. That meeting led to a November meeting with the Honorable Minister Louis Farrakhan at his home in Chicago where common ground was forged between the two groups in their commitment to traditional values and the staunch belief in the one God. (r-l) Rabbis David Weiss, Moshe Beck and other senior rabbis of the Neturei Karta Orthodox Jewish community present Nation of Islam Chief of Staff Leonard F. Muhammad a plaque in honor of his visit. "We are here to continue the harmonious dialogue begun in Chicago," Mr. Muhammad said. "That meeting was an attempt at dialogue based on mutual respect in a spirit of reconciliation," added Rabbi David Weiss, who was instrumental in arranging the initial conference. Leonard Muhammad was joined by Nation of Islam Supreme Capt. Sharrieff Muhammad, Assistant Supreme Capt. Mustapha Farrakhan and East Coast Regional Representative Minister Benjamin Muhammad. Representing the Rabbinical delegation were Rabbis Moshe Ber Beck, Yisroel Feldman, David Weiss, Chaim Fryman, Hilel Deutsch, Yisroel Feldman and Chaim Lefkowitz. The afternoon meeting opened with Rabbi Weiss reiterating the need to continue on the path of clearing up the misunderstandings between Jews and the Nation of Islam. Chief of Staff Leonard Muhammad, while agreeing with the Rabbi, asked questions concerning Jewish theology and their concept of the coming of "The Messiah." Mr. Muhammad, during a phone interview with a New York daily newspaper, said Min. Farrakhan was "looking for unity among all people." Rabbi Weiss continued the theme of harmony, saying, "There is no reason Black people and Jewish people cannot live in peace together." After the day session ended the delegation was taken on a tour through the township. There were stops at an elementary school and a school where members of the Orthodox community were busy studying the Torah. While visiting a retail clothing store, Mr. Muhammad remarked that the two communities shared a sameness in the modesty of their garments. After the tour, the delegation returned to the home of Rabbi Gold where a sumptuous offering of food was prepared. Rabbi Weiss remarked that he and his associates were completely knowledgeable of the Muslim month of fasting, Ramadan. The Rabbis and the Chief of Staff continued their discussion on belief and culture. A plaque was presented to Mr. Muhammad, which he humbly accepted, thanking his hosts for their hospitality. Before leaving Mr. Muhammad extended an invitation from Min. Farrakhan for the rabbis to attend the Saviours’ Day celebration in Chicago on February 27.